Many people with a disability or long-term health condition are able to undertake osteopathic education and training, achieve a Recognised Qualification, and practise osteopathy with or without adjustments to support their practice. We publish guidance on the management of health and disability for students and osteopathic educational institutions. This was developed by external experts in equality and health education, after holding focus groups and interviews with staff in osteopathic educational institutions. We are committed to equality and want to ensure that disabled people who have the potential to become independent osteopathic practitioners can consider education, training and a career in osteopathy. are revised editions. Details of the revision process, including a consultation, can be found in a paper presented to the Policy Advisory Committee in 2016. Students with a Disability or Health Condition: Guidance for Osteopathic Education Institutions. 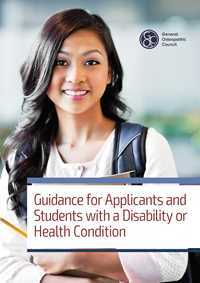 Guidance for Applicants and Students with a Disability or Health Condition.